Denver's follow-up campaign after their Super Bowl season left a lot to be desired. Well, not a lot, really. Just a quarterback. Denver won nine games last year on the back of its devastating defense. The Broncos fielded a Top 5 total defense for the third year in a row, and, despite some offseason personnel shuffling, they should be in that neighborhood yet again. 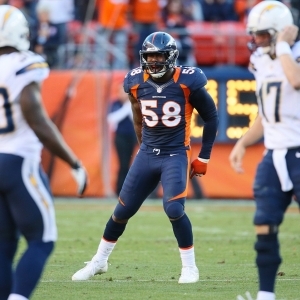 Von Miller is a force, and Denver's secondary is the best in football. They did lose Wade Phillips, but the scheme should remain under new coordinator Joe Woods. Also, new head coach Vance Joseph was a former defensive coordinator in Miami, so I am sure he will pay special attention to making sure that side of the ball stays up to snuff. But the defense proved that it can't win games by itself. Denver's rushing attack tumbled to No. 27 in the league last year. And that was due in part to the fact that absolutely no one feared the Denver passing game (No. 21). Neither Trevor Siemian nor Paxton Lynch rose to the challenge to take control of the offense. And as a result they enter this season with another quarterback competition (and potential QB controversy). I don't know if it even matters whether Siemian or Lynch is at the controls. Neither is particularly good. Siemian is sold as being more conservative and, in theory, less turnover prone. But Lynch had a lower interception percentage and essentially the same completion percentage. Regardless, Demaryius Thomas and Emmanuel Sanders seem doomed to another underperforming season wither either Siemian or Lynch airmailing them down the field. The Broncos started 4-0 last year, but a late-season swoon (2-4) sabotaged their attempt to make it back to the postseason. They will need another fast start - and the Broncos open with four of their first five games at home - because they close the slate with four of their final six games on the road. Denver also has a stretch of three straight road games (including a short week after a Monday-nighter) right before a big November tilt with the Patriots. Denver is a tough team to get a read on. The Broncos have only had two losing seasons over the last 17 years and just five losing seasons in the past 34 years. They still have the potential for a Top 5 defense and will likely remain in the Top 10. So the whole campaign probably comes down to the offensive line. If the Broncos can run the ball, that will take pressure off whichever mediocre quarterback they decide to back. I don't like this number at all. History says that the Broncos are a strong bet to get to nine wins, something they've done in 14 of 21 years. So I will trust history with a tepid recommend on the 'over'. But there's no way I would play this number and I don't make a habit of betting on teams that go into August without knowing who their quarterback will be.